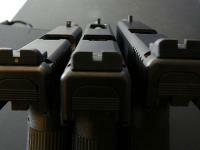 12glocks - Brian Enos's Forums... Maku mozo! AR15 Criterion Barrel to Receiver ~ How Tight is Too Tight? I would heat the barrel with a heat gun, I suspect this will do it. I would add the Loctite 609 because it will at 3000 PSI tensile strength and increase the rigidity of the interface. Like the other poster suggested I also measure the OD of the barrel extension and the ID of the receiver. They should be very close. I am a believer in this technique obviously. I see some 17L's in 3 gun and some 6" 2011's too. TTI has a 17L variant. I had a 24 that I shot limited with in IPSA. There are a lot of Glock 34's in 3 gun. If they come out with a Gen5 17L I may get one for 3 gun because I am definitely on the Gen 5 bandwagon. I worry the 17L could be a little nose heavy. I shot one years ago and it shot well is all I recall. You should get one and see if you like the 17L. If Not you can sell it. Yes! I think a match saver would be a nice addition to a goose gun also. That something that is on virtually every 3 gun shotgun. Here is a link in case its not on your radar. You don't need it for your first match. http://www.matchsaverz.com/Matchsaverz/Home.html I have had the best luck with this one, not the copy I tried. One of my good freind's in the game has run the SBE's (his sons shoot also). You need to run hotter ammo and you can't just buy a carrier for them. But I would make the port easier to load . now and if you love the game and your a Benelli man get a M2 or Beretta n 1301 or maybe a Breda. The M2's are nice because they run the low recoil slugs well. The Beretta's are nice but I heard from a good source they Benelli port can be made a little better. BUT I know that Beretta relocated the serial number so maybe that is no longer true. Just get out and shoot. Any changes you want will be self evident I think. I wan't to try a notch hat! TTI Grandmaster kit. Simple, cheap and effective. I put channel locks on the handle shaft near the bottom and the appropriate box end wrench on the nut and tighten it. It scratches the surface of the handle a little but does not move. I found just holding the handle and tightening did not work. Thanks for the update and sending me the file! I loaded a unzippng utility on my Macbook. After extraction there were only 27 loads so it must have been corrupted at some level. I appreciate the hard work of the OP in this endeavor and have seen some of his data before and it was good! I would like to say with the greatest respect that in the era of high speed internet connections, I don't really think it's necessary to compress a spreadsheet file. It's not a audio or video file so and excel file should download in a second or two. The old KISS rule is coming to mind here. I am not sure if the OP's compression utility is proprietary or the decompression is not making the jump to my Mac or what? OR, perhaps there is some forum specific file size requirement issue, I don't know? At any rate, I give up here unless someone would graciously like to upload a noncompressed version of the file. Thanks for listening. What is a .7z extension? I have office and was unable to view the data. I just installed office so I wonder if I have a glitch. I followed the steps in the series above. Interestingly, the first barrel i got my wife for 3 gun was a Odin Works 18" 3 gun barrel. We put a couple hundred rounds and one match through it. It was too heavy for her and we changed it out for a lighter barrel. Later when I shot out a barrel on my match rifle, I took her original barrel (which shot about .75 MOA) and mounted on my rifle with a new tight BCM upper which I lapped and bedded with green loctite. It shot 0.38 MOA after that, a real hammer. I just rebarreled another rifle for my son and used the same technique. I have not shot it off a rest yet though, just got it kinda zeroed and adjusted the gas block Saturday. I am convinced this technique is a benefit, not a detriment. I am not a member at Snipers Hide, but my impression is there are some posters over there that are pretty sophisticated as far as reloading and longer range shooting goes. Ball powder for 77 gr 223? I shoot 75/77 class bullets for 3 gun. You will get higher velocities with the ball propellants as a rule owing the the higher nitroglycerin content. I have tried the older propellants like 748 and BLC-2 and there ok but I find that they do not have a broad accuracy node and are more finicky. I found CFE 223 accurate across a broad range basically from 24-25 grains with a 75-77 grain bullet. It is easy to find a load for and accurate in a lot of guns. You can safely load way above that 25 grains according to the last two Hornady manuals for a 75 grain HPBT. TAC is also good and there is a known accuracy node (IMO) between 23 and 24 grains. Western powders has 5.56 data published for this propellant and 2520 as well and you can go much higher like the CFE but I lost accuracy in hand lapped match barrels. I use 8208 XRB because its temp stable and meters good through my Dillon measure with lower SD's than any ball propellant. I think it is the most accurate powder I have ever used. Make sure you check all the load data, the manufacturers website says 23.2 is max for a 77 SMK. The Lyman, Hornady and Berger manuals I have are more conservative than that sadly. Make sure you work up to 23.2 if you try it. When I called Sierra they quoted me the 23.2 for the TMK as well. I load for 3 match rifles on a 650 and the ammo is solid sub moa, SD's are in the high teens.